We had Corned Beef (with plenty of white sauce) for dinner last night. I’m sure it’s the same for many of you; certain meals bring back certain memories. Food has a way of tying together events and celebrations – and of course people. For my mind, there is no greater joy than preparing, cooking and sharing food with loved ones; everybody does it in some form every day, all over the world, whether it be a quick midweek dinner or a birthday banquet. The trend of food photography has enhanced the visual description of the feast, and although popular for a while, the fad of Facebook-ing or Instagram-ing your restaurant dinner has seemingly dropped away (a little at least). 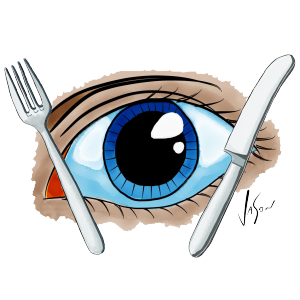 Even still the visual description of what you ate always comes up when telling somebody about your food experience, no matter how small or strange. We eat with our eyes first and the visual appeal of a meal can make our mouth water, albeit sometimes the end result doesn’t taste as good as it looks! Just as food can recall good memories, food can remind you of bad experiences too. Like the curried noodles Dad and I ordered in a Chinese restaurant of a small country town. Why we ordered them in the first place I have no idea, but when the two minute noodles came out with curry powder lightly sprinkled on top, I wondered what to do… Dad wondered why they cost $9.00. Interestingly, the same corned beef that I now genuinely enjoy, I couldn’t eat for years, scarred by my time in the Northern Territory where corned beef and pickles was a staple. I’m sure the camp cook salted the beef in his hat. It seemed to be always warm and it was heavily trimmed, I presume to remove the unsavoury greener bits… and the flies. Every now and then, after one of the boys had a whinge about a meal that he had prepared, our cook would hide a good dose of Epsom salts in the beef pickle, just to remind us that he required respect. One of my best meals from the NT was far away from the camp fire and swag. After nearly two months of seven day weeks branding weaner cattle in the peak of the dry season, we had a four day break and drove to Mt Isa. Having gone without fresh bread for months, my hungover soul sat on the bonnet of my ute in the early morning with a loaf of ‘still warm’, super fresh bread and some butter. I used my pocket knife to crudely hack off chunks of steaming bread and smear it with an unhealthy amount of butter. You know you have enough butter on your bread when you can see teeth marks in the butter… it was pure bliss. Winter is a great time to enjoy good hearty meals. We have introduced our own line of ‘ready to eat’ stews, available at the markets now and online in the coming weeks. Pies and tasty pastries ready to bake for dinner will be available soon too. We have also adapted Yotam Ottolenghi’s Lemony Leek Meatball recipe for a quick midweek meal, and we have many more meals in the pipeline. If you have any favourite recipes that you cook for your loved ones we would love you to share them with us via email or on our Facebook page.